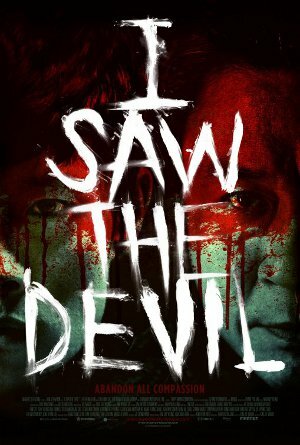 The other day I watched a wicked and ultra violent 2010 thriller called “I Saw The Devil”, and it was awesome. When Secret Agent Soo-Hyeon’s (Byung-hun Lee of The Good, the Bad, the Weird) pregnant fiancé is murdered by Serial Killer Kyung-chul (Min-sik Choi of Oldboy), he decides to do anything to exact revenge, even if it means becoming a monster himself. The agent’s use of a clever tracking device allows him to listen to the serial killer. Each time capturing him to exact some sort of violent revenge, only to then release him and do it again, each time more vicious then the last. The film is directed by Jee-woon Kim, who also made some of my favorite films, which include A Tale of Two Sisters, The Good, the Bad, the Weird, and A Bittersweet Life. These films, I think, are still available on Netflix streaming, and are also highly recommended by me. This film is a vicious game of cat and mouse, and is not recommended for the squeamish, I was even shocked at some of the ultra graphic violence that happens and I love horror movies. I think it was the lack of remorse of the serial killer character that was more appalling. Asian cinema constantly impresses me more and more; they have something that American cinema do not, which is originality. If producers decide to remake this it will be watered down and bland, just like when Will Smith wants to remake “Oldboy”. While the acts of depraved violence do occur I don’t think of this film as some sort of exploitation film. The film is more of a suspenseful thriller, where violence like this occurs. The cinematography is beautifully shot and the story is intense and devious, with plenty of twists. The acting is amazing also; you are quickly drawn in to both worlds of the main characters, and are easily able to feel their pain and rage. There is enough stuff packed into this film to make several. So watch it,... I DARE YOU.